﻿ Welcome to PACHET BROOK TREE FARM! Begin Your Christmas Memories Here! Visit our 90 acre historic farm, the home of Rhode Island State Champion Tree for five consecutive years. We supply the Governor's tree at the Rhode Island State House. Our trees have gone to Washington D.C. to Congress. They grace the Newport Mansions, city halls, colleges, malls, and the homes of many families. Take a hayride out to the fields. 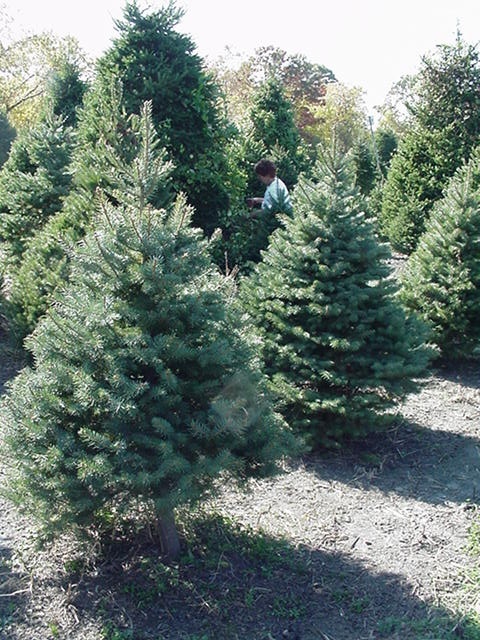 While strolling through our fields, you can choose the Christmas tree you want for your home. We look forward to greeting you at our farm this holiday season. Please see our Contact Us page for seasonal hours of operation. We grow 7 species of Christmas trees for tagging and for choose and cut. 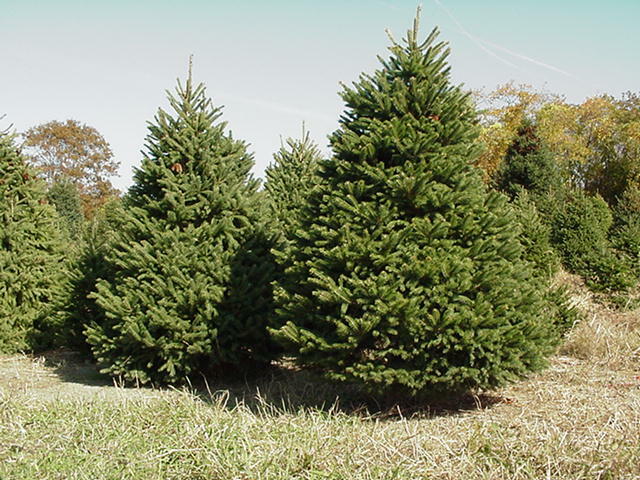 The tree species are Balsam Fir, Douglas Fir, Fraser Fir, White Spruce, Meyer Spruce, Norway Spruce, and White Pine. 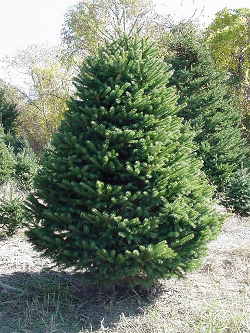 We have trees up to 25 ft. Click the tree images below to learn more about the species. 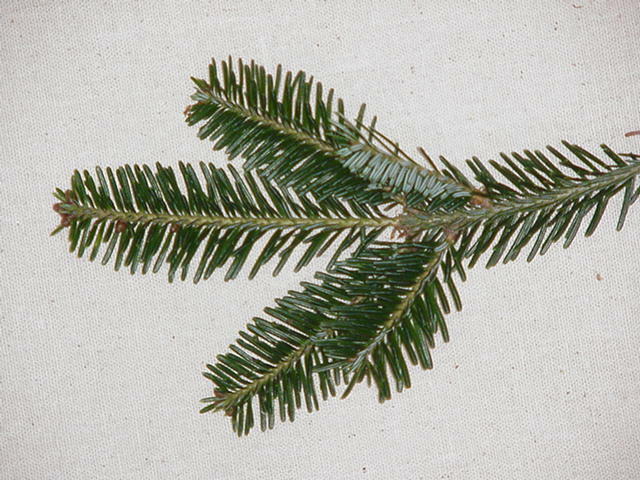 The Balsam Fir has short, flat, long lasting needles that are 3/4 - 1 and 1/2 in. in length and rounded at the tip. 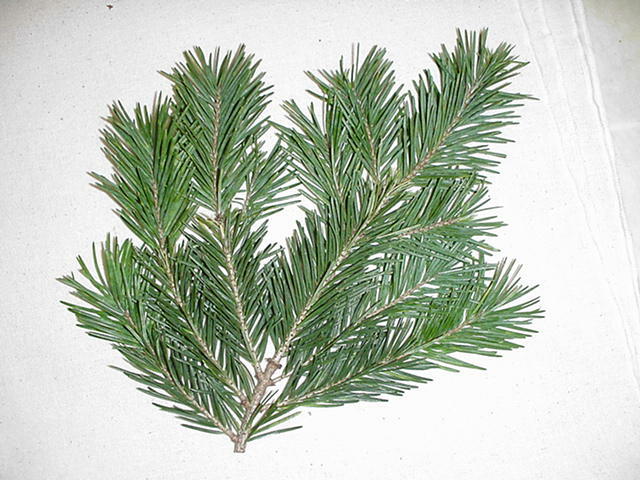 It has a nice, dark green color with silvery cast and retains its pleasing fragrance throughout the Christmas season. "A traditional Christmas tree that most Americans grew up with." 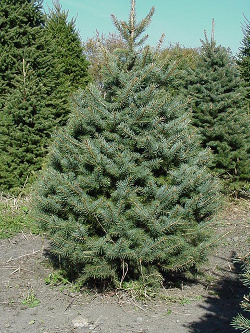 The Blues Spruce has dark green to powdery blue; very stiff needles, 3/4" to 1 and 1/2" long; good form; will drop needles in a warm room; symmetrical; but is best among species for needle retention. 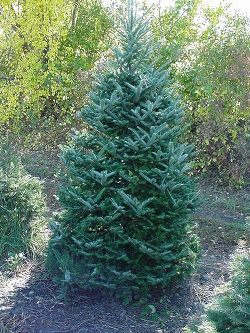 Its branches are stiff and will support many heavy decorations. "The needles really do have a bluish look to them." 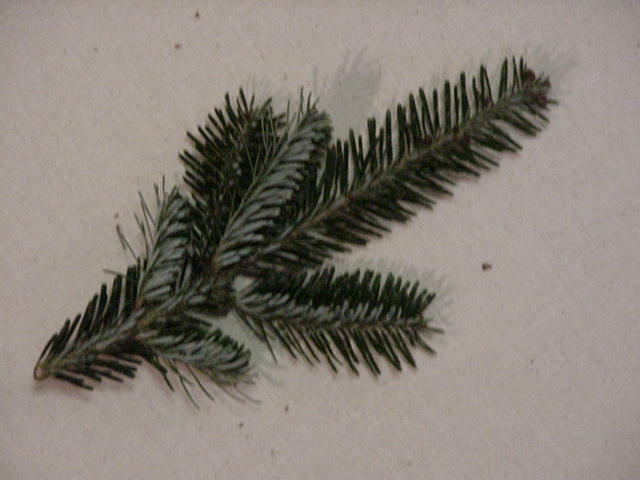 The Douglas Fir holds blue to dark green; 1" to 1 and 1/2" needles which have one of the best aromas among Christmas trees when crushed. 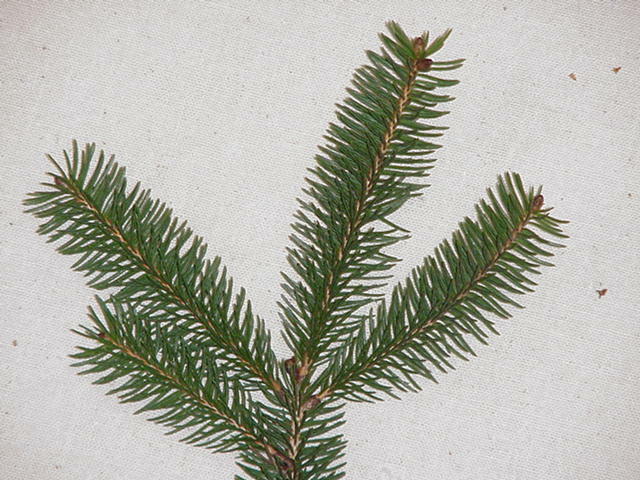 The Douglas fir needles radiate in all directions from the branch. 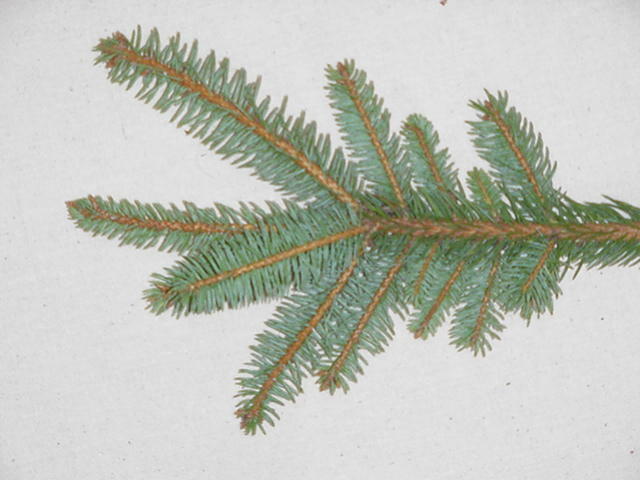 "One of the top major Christmas tree species in the U.S."
The Frazier Fir has dark blue-green, flattened needles; 1/2 to 1 inch long which are dark green on the top and silvery underneath. 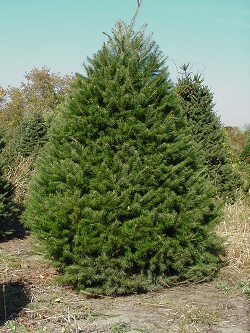 The Frazier Fir has good needle retention, a nice scent and pyramid-shaped strong branches which turn upward. They have good form and needle-retention. 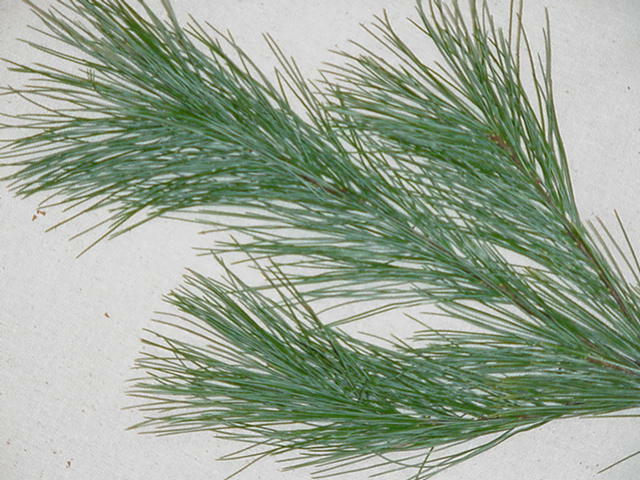 The White Pine has soft, flexible, blue-green needles, 2 to 5 inches long in bundles of five. 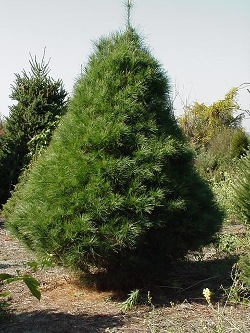 The White Pine retains its needles throughout the holiday season, has avery full appearance with little or no fragrance. These trees aren't recommended for heavy ornaments as their brances are slender. "Lesser allergic reactions as compared to more fragrant trees." "The White Spruce is excellent for ornaments." TAGGING - Choose your tree and reserve it until you return to have it cut. 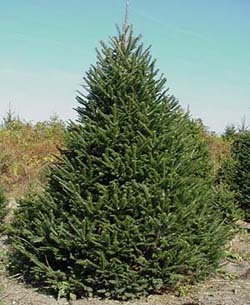 CHOOSE AND CUT - Choose your tree and we will cut it for you; or you may cut it yourself. We provide the saw. TREE BALING - A Howey Tree Baler wraps your tree for easy handling and set up in the stand. We bring your tree out of the fields, and tie it on your vehicle. TREE STANDS - We sell 4 sizes of Gunnard Tree Stands, an excellent stand for easy setup, and it is guaranteed. 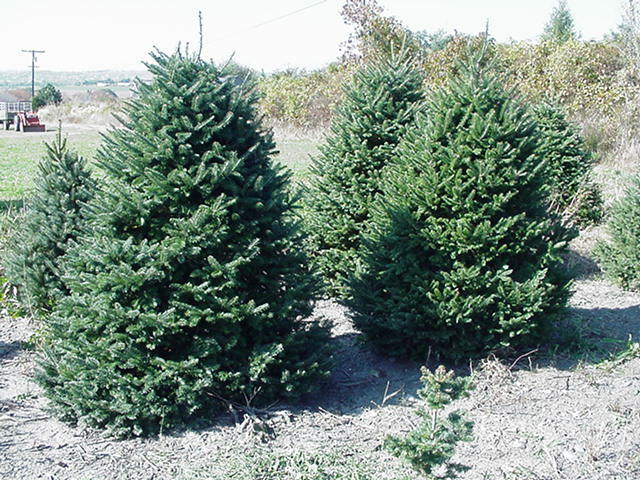 LIVE TREES - We sell live spruces for Christmas. WREATHS - We sell wreaths made from greens grown on our farm. ROPING - We sell laurel roping. GIFT SHOP - In our gift shop, we sell crafts made from local crafters, honey from our beehives, beeswax candles, and ornaments. REFRESHMENTS - Hot cider, hot chocolate, and baked goods are sold in the gift shop. We have bathroom facilities. HALLOWEEN HAYRIDES AND PUMPKIN HUNTS: Our fall hayrides are well known for wholesome family fun during the months of September and October. A 30 minute hayride on the farm takes you through woods and fields that are decorated for the season. Decorations are appropriate for small children and enjoyable for all ages. The ride ends at a "Pumpkin Patch" where pumpkins can be purchased. Please see our Contact Us page for hours of operation. GROUP RIDES: Group rides are available weekdays from 1:00PM - 4:00PM and are so much fun for family, scouts, church groups, seniors, daycare centers, preschools and school field trips. Group rides are also a fun idea for a birthday parties. Groups of 8 or more require reservations. CAMPFIRE PARTY HAYRIDES: Enjoy a hayride through the woods and farm. After your ride you are invited to enjoy the campfire where you can roast hot dogs, make smores and have a party so feel free to bring food. Reservations are required for groups of 8 or more. BIRTHDAY PARTY HAYRIDES: Parties are very popular during the fall as the farm is decorated for the season and our Pumpkin Hunt Hayrides are part of the festivities. Cmampfire Party Hayrides are always a great idea for a birthday celebration for any age. Please call or email for questions and reservations. 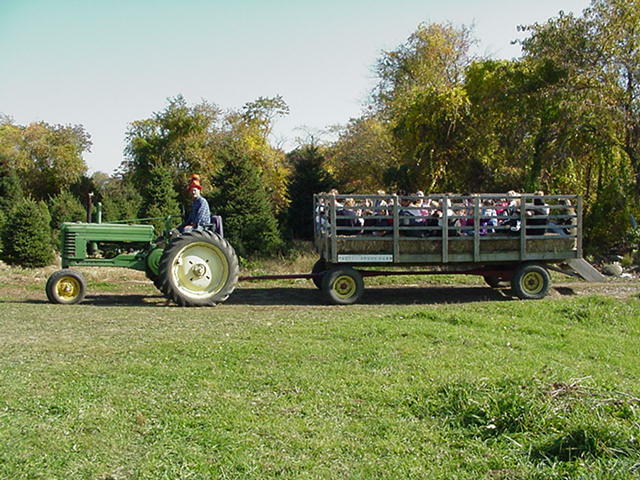 SCHOOL FIELD TRIP HAYRIDES: We offer fall and winter hayrides with an agricultural program for schools. Please call or email for more information. WEDDINGS AND PHOTOGRAPHY: Our farm is also available for weddings and photography. Please call or email to discuss your event. We do have restroom facilities. Pachet Brook Farm is a historic farm located in South Tiverton and Little Compton. Operated by the same family for the past 100 years, the farm located on a hill has scenic views of the surrounding countryside and is a great place for a family outing. 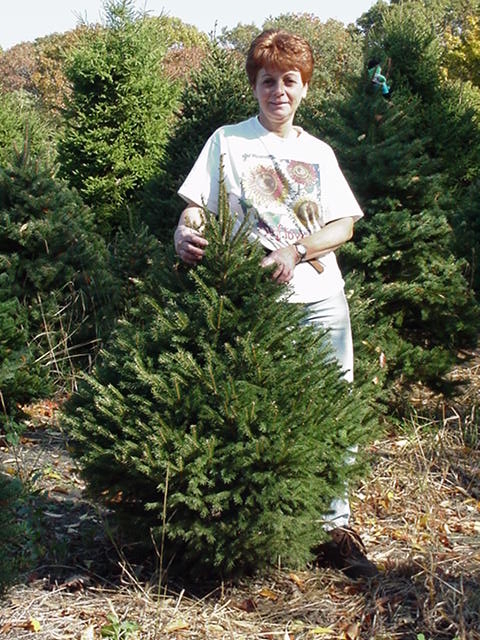 We are a Blue Ribbon Christmas tree farm. 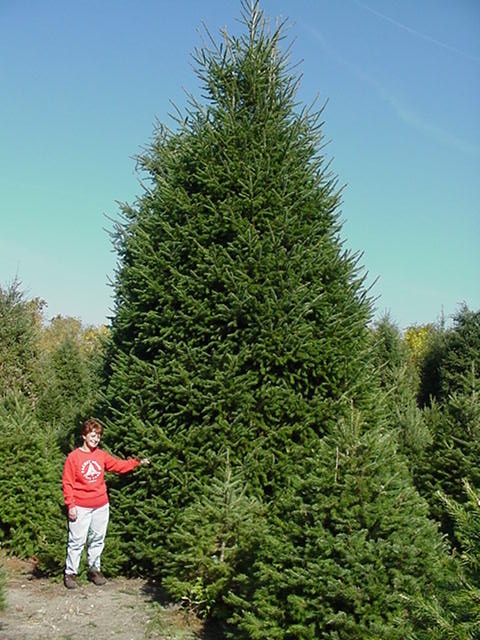 We grow seven species of Christmas trees for choose and cut. We grow pumpkins and gourds for sale and for use in our Halloween Hayrides. We grow Aborvitae, a landscape tree. We also grow flowers for cutting, butterfly gardens and for our beehives. We are well known for our hayrides: Halloween Hayrides and Pumpkin Hunts, Campfire Hayrides, School Field Trip Hayrides and Brithday Party Hayrides. When you visit our farm, we suggest you bring your camera. Take Rt. 95 to Rt. 95 East, exit 8A to Rt. 24 South, on Rt. 24 take exit 5 to Rt. 77 Spouth. Turn left onto 77, go 7 miles to a traffic light. Go through the light and continue 1 1/2 miles. Pachet Brook Farm sign is on the left, turn in front of sign onto dirt road. Take Rt. 24 South to Rt. 195 West to Rt. 24 South (Newport-Tiverton exit). Take exit 5 on Rt. 24 and foollow directions above. Take Rt. 114 North to Rt. 24 North to Tiverton Rt. 77 South exit on the Sakonnet River Bridge. Take 77 South and go 6 miles to a traffic light. Go through the light and continue 1 1/2 miles to Pachet Brook Farm sign on left. Turn in front of sign onto dirt road. Reservations required for groups of 8 or more!